About six months ago, I changed my e-mail sign-off. This may seem like a trivial thing that many people wouldn't notice, but sometimes the small details about how you manage your practice have a big impact. After reading an article entitled 57 Ways to Sign Off an Email, I decided to change my e-mail sign-off from the formal "very truly yours." "Very truly yours" was an e-mail sign-off I never thought about until I read this article. It was just part of my signature on letters, and therefore e-mails as well. It came from a partner at the first firm I worked at, and I never thought about what it said about me or my brand. It didn't mean that I was "true" or "yours". It just meant "this is the end of the e-mail." When I decided to make the e-mail sign-off my own, it went from something trivial to something I obsessed about. How could I convey "who am I" in one to three words at the end of an e-mail? I worried about being too informal or too formal. I worried about whether one sign-off could fit clients, vendors, and colleagues. But when I focused on what my firm brand was about, only one option seemed right. 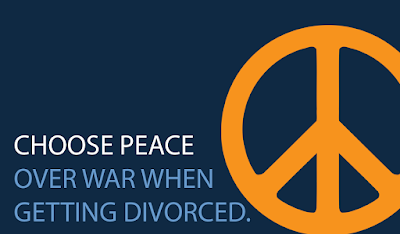 Ultimately, I decided to end all of my e-mails with: Peace ☮, and it changed more than just my e-mails. As as a mediator and attorney I have cases where I am in an advocate role and cases where I am in a neutral role. In either role, my goal is always to help bring peace to people's lives. 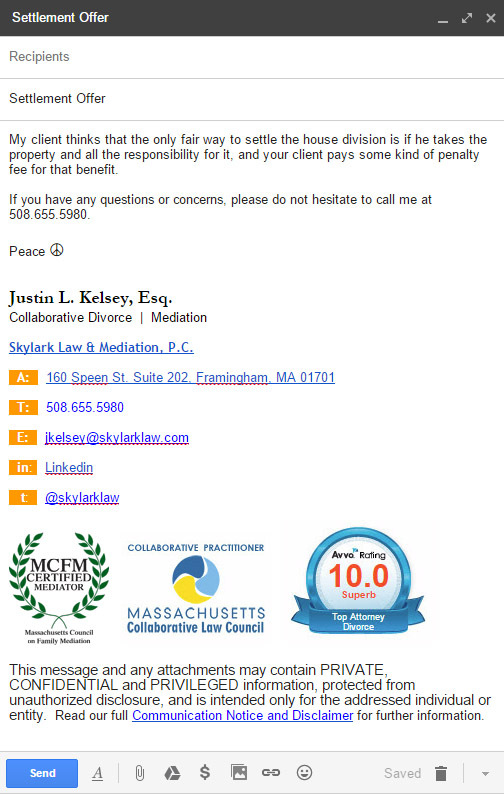 When writing an e-mail in an advocacy role, however, it can be very tempting to be forceful or aggressive. I wrote about this temptation in a previous post: Are Divorce Lawyers regularly violating the Civility Guidelines? But now, if I draft an e-mail, when I get to the end I ask myself, every time, "does this e-mail really promote Peace ☮?" If the answer is no and my sign-off doesn't fit the e-mail content, then is it really an e-mail I want to send? If the purpose of every communication I have is really to bring peace to my clients, then I should be asking myself that question at the end of every e-mail. Making what initially seemed like a small change, became an every day reminder of who I want to be as an attorney and a mediator. What is your e-mail sign-off and what does it say about you? Please share your sign-off or your opinion of my new sign-off in the comments below.